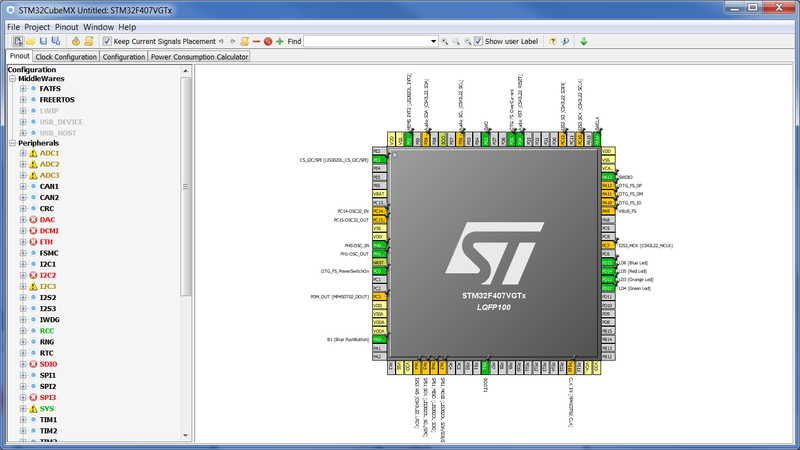 ST released new HAL library, together with STM32CubeMX codegeneration tool. They are good things, but still have too few documentation and articles in the Internet. 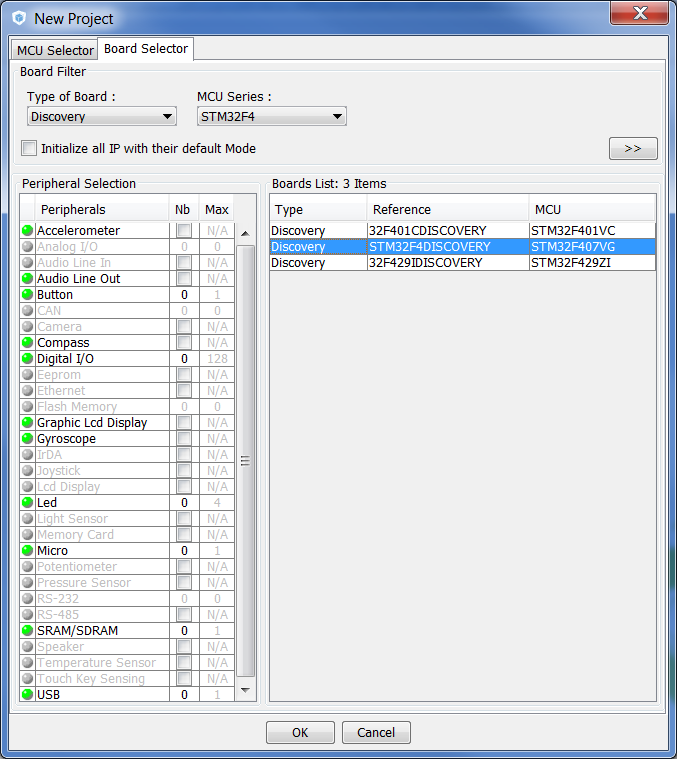 I've tried to use DAC in couple with DMA in my board STM32F4Discovery. So, I'll describe the whole process of developing sine wave generator using STM32CubeMX utility and IAR. First of all, we'll start new project in cube. 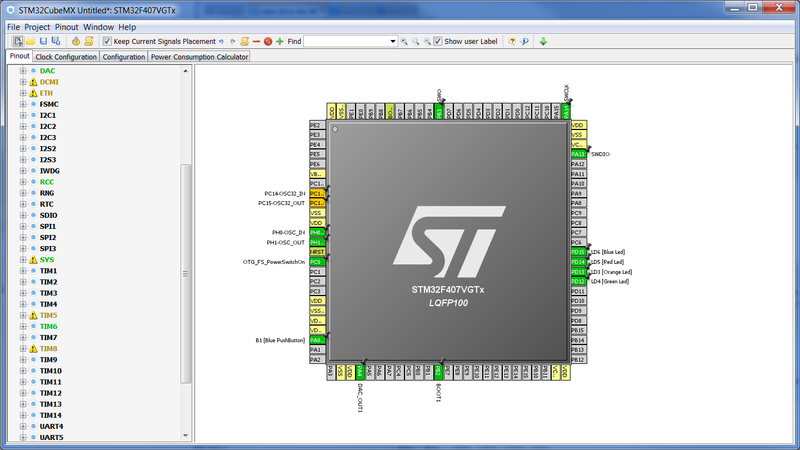 We have "board Selector" tab, where we select our STM32F4discovery board. We set all not necessary pins at reset state - we do not neet it. What else we need? We need timer, which will send requests to DMA controller. I've chosen TIM6. 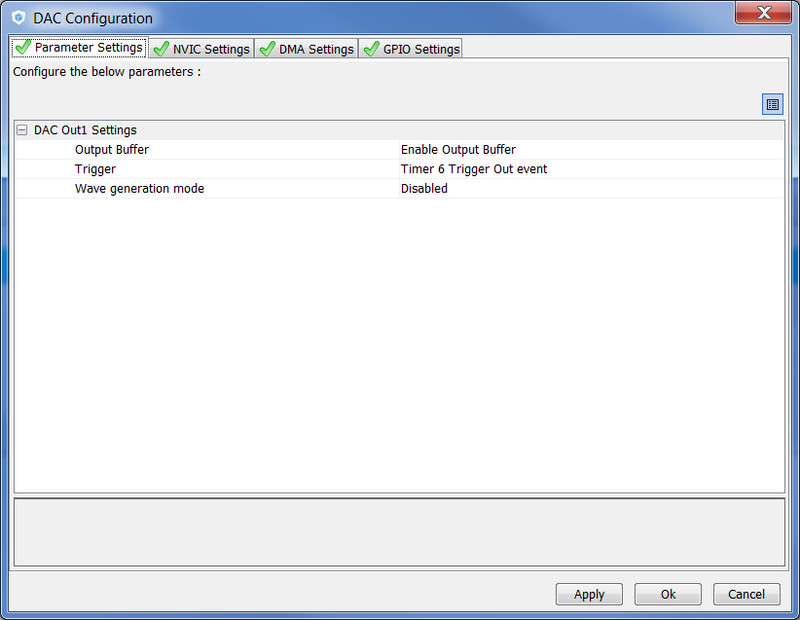 To enable it, in "Configuration" tree, select "Peripherals->TIM6->Activated" branch and check it. 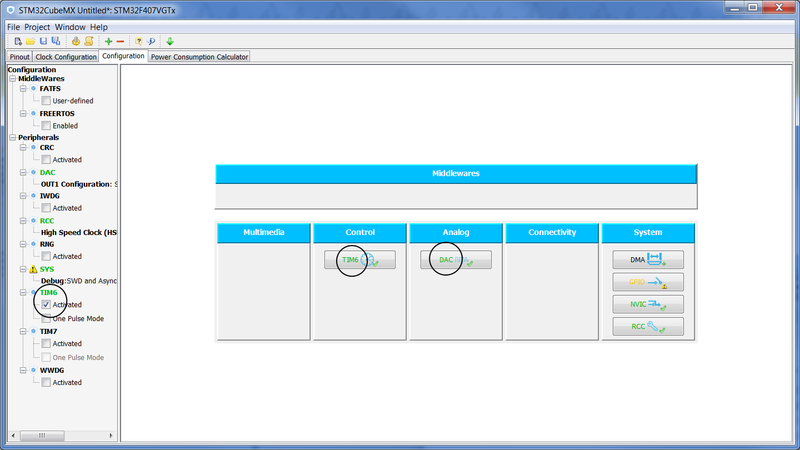 Ok, now move to configuration tab. We need to tune TIM6, DAC and DMA. 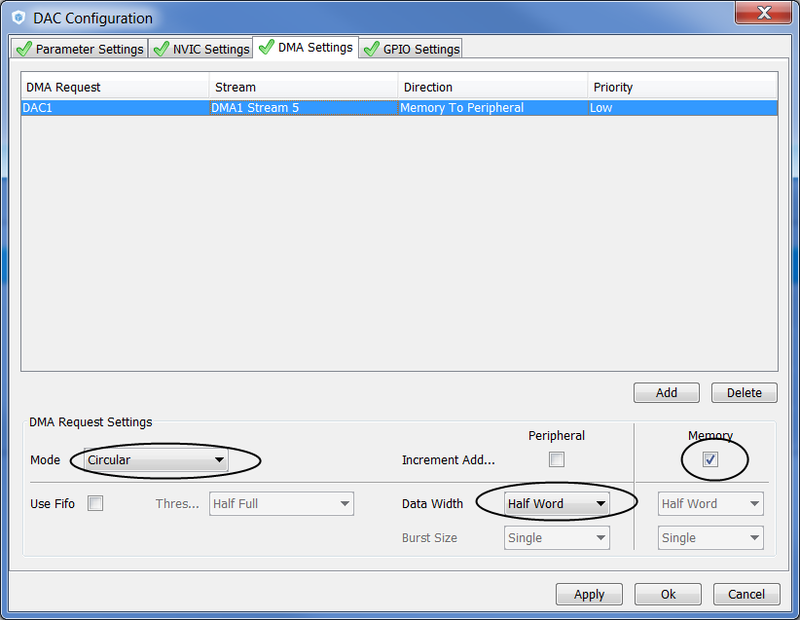 press "add", then set settings as on picture.Do not forget set "Mode" as "Circular" and set "data width" as "half-word"! "Circular" means that after the counter reaches the end of array, reading starts on the end. "Data width" - means "on pieces, of which length source array sliced will be". So, our sine wave will be stored in uint16_t array, so we need half-word mode(16 bit). 32 bit - is a word. Now, save project and press on gear button in toolbar - this generates code. Open project in IAR. 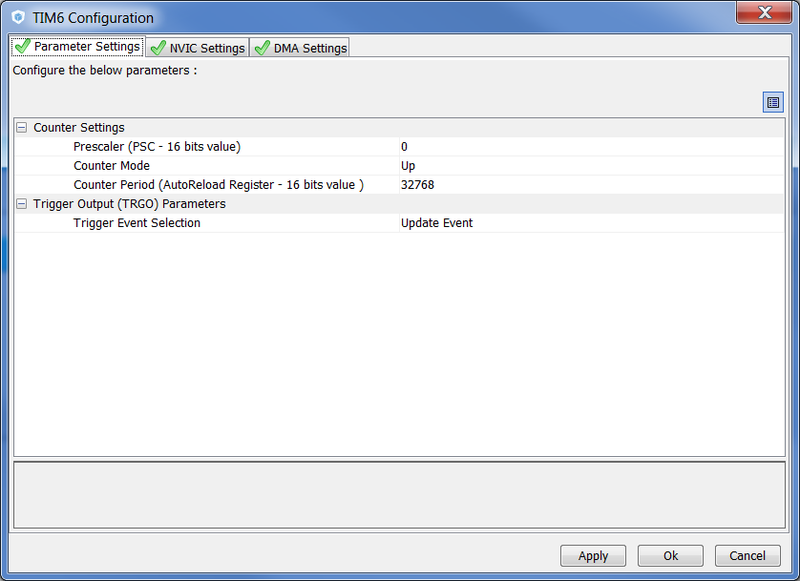 third - starts DMA and assign our array to DMA. I was wondering if this code is also applicable to Nucleo Boards (such as the STM32F3 in my case) not just the Discovery Boards. I created a code using your steps as a guidance. Everything is the same other than the fact that the only pin I have configured is the the DAC_OUT1 at PA4 (so our pin out diagrams would look different). It compiled without any errors on both an IDE (SW4STM32) and online Mbed Compiler; however, I could not upload the code. Mbed created a .bin file yet LED1 never blinks to indicate it is uploading also no signal out of PA4. For the SW4STM32, LED1 never stops blinking and there is no signal out of PA4. Baud rate was set to 9600bit/sec. I am not sure if you encountered this issue. It would be deeply appreciated if you would reply. Thank you. Did you tested simple "blinker" project with your environment? As I remember, Nucleo and Discovery have different versions of ST-Link. Check them both: Run->Debug Configurations-> Debugger. There you can select "Manual Spec" radiobutton, and select "ST-LinkV2" or "ST-LinkV2-1". Anyway, I have stm32f4disco and nucleo401, both works well in SW4STM32. Thank you so much for your reply. I have not tested a simple "blinker" project since it has not been provided unlike Discovery Boards which come with it. I attempted with both ST-LinkV2 and ST_LinkV2-1. Same results unfortunately. I debug as Ac6 Application with Current toolchain to Ac5 SSTM32 MCU GCC and current builder: Gnu Make Builder. I am not sure if the path is causing this behavior. If you have any more suggestions it would be much appreciated. I spent about 10 hours trying to figure this out and failed. Your comment about the poor documentation provided by STMicro is so right! Thank you. what sampling rate the timer will generate?.. Kindly help how to generate exact 44.1Khz sampling rate which is very essential in my project. I do not know any other way except calculating prescalser, period and clock of timer by hand. Here https://electronics.stackexchange.com/questions/132000/stm32-series-microcontroller-calculations-of-timer-variables you can found that author wrote code to calculate appropriate values, but I do not know, if it is ok.
Also, to get perfect clocking, you chose crystal oscillator with another frequency, to get 44.100 as perfect fraction of some audio sampling freq(for example, there is 22.5792 MHz quartz, which is 512×44.1 kHz, or 14.112MHz= 320x44.1 kHz). The full list of oscillator freqs is here: https://en.wikipedia.org/wiki/Crystal_oscillator_frequencies. Hey, very clear tutorial, thanks! Is there some way I could update value of DAC myself in some interrupts or even main loop, to manipulate frequency during work of program? It seems to create a FIFO enable error. I ended up ENABLING FIFO to get it to work. See here more about it..
would you mind elaborate on the process? Working just fine, thanks a lot! Several years ago I wrote couple of articles about beautiful library u8glib in context of STM32 microcontrollers. Time moves on and author of this library released newer one, u8g2. u8glib is officially deprecated and not developed anymore. We cannot afford to lose code support for our libraries, time to move to newer library! Differences between these libraries are listed there, also there are a lot of helpful information about u8g2 library. It is not so hard to modify your old u8glib code for newer library. I'll show you how to use this library with Nucleo-F401 board and SSD1306 display, bought on Aliexpress. Display connection is SPI, pins are GND, VCC, SCL(the same as SPI clock), SDA(the same as MOSI), RES and DC. I use CubeMX code generation tool to initialize all the peripheral. OLED_RES and OLED_DC is just GPIO output. SPI1 initialized with default parameters. 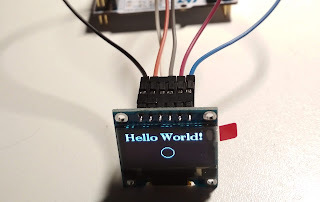 Elastic Notes: STM32 + I2C OLED SSD1306 + u8glib + CubeMX: If you think, that title of this post consists of all possible random words, you are wrong:) This is what I've try to chain right during couple of days, but it was not so simple, as I thought at first time! RFFT in CMSIS DSP. Part 1.